The Sky is Everywhere is the type of novel that makes me devastated that I only know five languages. You see, perhaps if I knew more words in different languages I could find that one perfect word to describe what this book is. All I know is that it doesn’t exist in the English language. Nelson’s debut is a raw, visceral experience, one that you need to live through yourself to understand its beauty. It’s the type of novel that makes me realize that I’ve been looking at the world the wrong way all my life, but maybe I’ll see it with new eyes now. From the surface, The Sky is Everywhere seems to be your run-of-the-mill contemporary story of love, loss, and growing up. In some ways it is, but it is also so much more. Lennie Walker has just lost her older sister, Bailey, who is the pillar of her existence. While Lennie re-reads Wuthering Heights in her spare time, practicing her clarinet in a corner, it is Bailey who goes out into the world, making her imprint on everyone she comes across. Without Bailey, Lennie is left alone with only her Gram and Big, her uncle. Now, lost and alone, Lennie feels as if no one can understand her pain. No one, that is, except Toby, Bailey’s boyfriend the boy who somehow makes Lennie’s pain recede. Very quickly, their relationship escalates into a phase that can only be described as clearly-not-platonic. Yet, while we watch as Lennie slowly makes her life spiral into what is sure to be a train-wreck of a disaster, Nelson enables us to simultaneously understand what grief can make you do. With Toby, Lennie finds someone who feels the loss of Bailey just as sharply as she does. Moreover, the loss Lennie feels comes at a time when she is confused about her sudden outbursts of sexual need. All in all, it seems as is Lennie is a character doomed for tragedy. There was once a girl who found herself dead. In the midst of this already confused romantic mess, though, walks in Joe Fontaine, the boy who plays the trumpet like an angel himself. Joe enters Lennie’s life and makes her remember, makes her revive herself. It is Joe who makes Lennie resume her clarinet playing, who uncovers the musical background behind her name, who ingratiates himself into the Walker household, charming her Gram and Big both. Although Joe seems to be nearly perfect himself, it is obvious he has problems of his own, but these only add to his charm. As a flawed, but realistic and understanding character, Joe Fontaine is what we all imagine in a perfect guy. When Joe and Toby meet, though, and the two halves of Lennie’s life – one filled with grief and the other filled with love – come together, Lennie is left alone. It only now that Lennie begins to realize the truth about grief. What I love about The Sky is Everywhere is that it is a quirky novel about flawed characters who, no matter who else they have for them, have to make their way in life by themselves. Whether it is Toby and Lennie, who are drawn together and then apart because of their grief, or Gram and Big, who are experiencing this tragedy in their own way that Lennie fails to understand, each of them ultimately comes to terms with what this loss means all on their own. Ultimately, this journey is one that needs to be self-realized. The Sky is Everywhere is a beautifully written novel, dispersed with small poems or snippets of conversation that Lennie writes on discarded pieces of paper or cardboard and throws right back where she found them. It is these poems that give us the most insight into Lennie’s heart and the depth of her hurt. Moreover, her day-to-day life is filled with unexpected moments of grief where, quite suddenly, Lennie aches for her sister’s presence. Growing up in a household without a mother, Lennie and Bailey have formed a bond that is closer than that of even most sisters which makes the pain Lennie feels all the more acute and nuanced. One of the greatest adventures Lennie undertakes throughout this story is the one of her missing mother. Gram has always told Bailey and Lennie that their mother is an adventurer, the type of person who cannot be tied down to one spot, but, they should never worry for she will return home one day. According to Gram, it’s a gene the Walker’s have, one that makes them just get up and leave, only to return decades later. As Lennie comes to terms with what her missing mother means to her – and meant to her sister – though, she gradually comes to learn about herself along the way. Even more, Lennie comes to realize the gift that is her family. Although Lennie may not have a conventional family, it is one full of love and through her grief, Lennie never realizes what a pillar they are for her, even when Bailey is gone. It is this relationship of family, of re-defined lines of mother-daughter relationships that truly struck a cord with me more than anything else in this story. The Sky is Everywhere is a novel with a little bit of everything – romance, first love, grief, loss, heartache, friendships, family, music, literature, happiness, and best of all, finding yourself. Unfortunately, my review barely even begins to cover the depth, poignancy, and beauty of this novel. Nothing I can say will ever do it justice. Jandy Nelson has written a debut that makes its way into your heart and lives there with you, ever-present in your thoughts. In the few short weeks since I first picked it up, I’ve already gone back and highlighted my favorite passages (read: the whole book) and added post-its with my thoughts on the most contemplative areas (read: every chapter). It’s a novel I will cherish and read and re-read throughout my life. I just know it. What do you mean you only know 5 languages? ;) I can speak about 2 (if we're counting English!) and read only one another (though I don't understand a word of it). 5 is very impressive. As for this book... well, I suppose I really should pick it up soon, right? I've heard nothing but good things and your review is a further push. I do love emphasises on family in fiction, and it's great to hear that there is even a little bit of romance. I'm pretty confident that I'll like this one. Great review, Keertana! What a gorgeous review, Keertana! I'm so happy that you finally read this one and LOVED it. I agree that Lennie's poems were such a moving part of this plot and way to see inside her heart. I also was amazed at how much the author made us love and miss her sister Bailey, and that through small details - instead of cumbersome flashbacks - we truly got to know her and feel her loss. And Joe! Bat. Bat. Bat. He's high on my boy crush list, for sure! What a beautiful review, Keertana! I am SO happy you loved this, it's so beautiful and unforgettable. Most people were bothered by L and T, but I really understood. That kind of grief can make people do the strangest things. And Joe! Bat bat bat. Who can forget those eyelashes? I keep stalking Jandie for news of some new project, but so far, I found nothing. Ha -- did Heather's nagging get you to read this?? I am not quite sure why I've put off reading this book for so long. 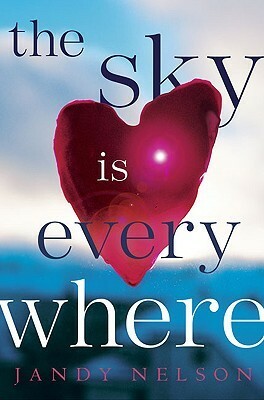 So many reviewers have written such positive reviews praising all aspects of The Sky is Everywhere. I think I've been hesitant because it is a contemp and there are hints of a potential love triangle, one of the sides being the dead sister's boyfriend (not really okay in my mind). But I do love a book with beautiful, poetic prose and reading your review now makes me realize that I really do need to give this book a chance instead of simply dismissing it based on preconceived notions. I haven't read the book yet, obviously, but your review and your admission that it's a book you'll want to constantly return to seem like incredibly high praise to me. Oh I KNEW this one would be your thing! It just so seems like your kind of book. I loved it as well, it totally and completely blew me away! This is such a lovely book - I cried so much the first time I read it. I think Nelson has such a beautiful way with words and I'm really looking forward to whatever she writes next.. I'm so thrilled to hear that you loved this! It's one of the few books on my serial re-read list. I'm also glad to hear I'm not the only obsessive highlighter. :-) I actually embarrassed myself by bringing my highlighted copy to a signing with Jandy, and she started flipping through it(!!). Luckily she seemed to think it was endearing. :-) Beautiful review, Keertana! Did you know that you can create short urls with AdFly and earn $$$$$$ for every click on your short links.